All-time great Manchester band and repeat Glastonbury Festival-headliner(!!) 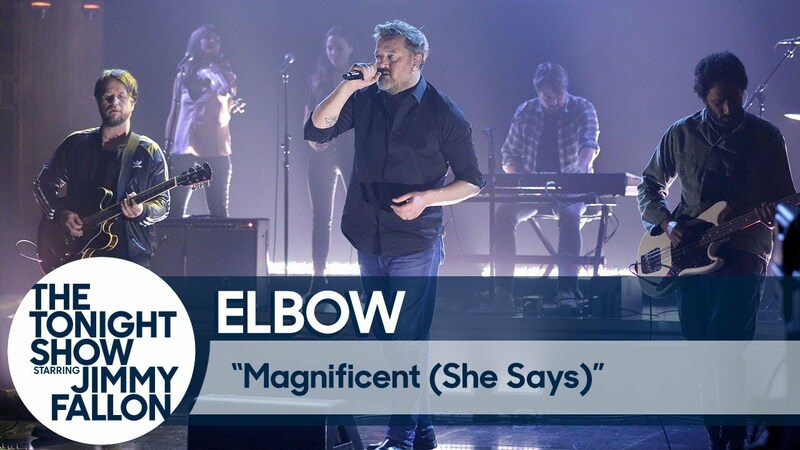 Elbow is currently touring the U.S. Having caught them live twice (first in 2011 and then in 2014), we can’t scream loud enough that this band is a must-see live! Leader Guy Garvey’s (Peter Gabriel-esque) voice and lyrics are alone worth the price of admission, but the other members are consummate players that meld perfectly on stage to, without-exception, deliver powerful, moving concerts. To get a feel, watch their recent performances on The Tonight Show. First, check out recent song Magnificent (She Says) off of their (of course) magnificent 2017 album Little Fictions. Afterwards, watch the band perform their ebullient, uplifting, fan-favorite anthem One Day Like This. Tickets are (inexplicably) still available for next week’s Fox Theater show in Oakland, The Observatory show in Santa Ana, and the Wiltern Theater show in LA. Elbow must be scratching their heads and asking “what the the hell do we have to do America?” You can pick up tickets for their US and European tours HERE. Don’t mess this up.